(2017-09-09, 22:58)heula Wrote: [ -> ] Where is the artwork downloaded from for the pvr recordings widget ? 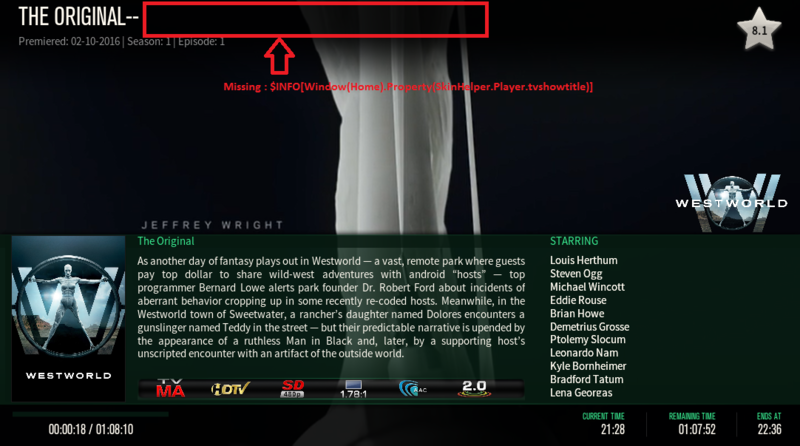 The widget for pvr recordings does not show images for all recordings. Some do but most of my Dutch recordings show a black thumb. Can I add the needed images somewhere myself when there is no artwork found? I can remember this used to be in previous versions but I can't find th artwork folder for pvr anymore. Open the add-on settings for the Skin helper metadata module, there you can set where the artwork is grabbed from and how to manually override it. Also note that once the feature is enabled, you will have a contextmenu option within your skin to set the artwork manually. Request : Is it possible to have the same for genres artists ? I think the mediatype should be randommovies too, same typo. (2017-09-13, 00:09)djhifi Wrote: [ -> ] Just to clarify as I have been away for some months. the dialog video info is not showing any information from RT+metascore etc on purpose right? I need to donate and get an API key to get it working? No, you don't NEED an apikey. All data is provided even without an api key but it will be slower and it will be cached longer, also it will print some nagging warnings in the kodi log. So, if you want the additional metadata for free and don't mind that the first retrieval takes a few seconds, the default is fine. If you want the latest and greatest and need it super fast, apply for api keys for all services. Sorry, I had some discussions with the metadata sites and this was the only way to keep it alive. We don't want to overload those free metadata api's. MetaScore is still provided, for RottenTomatoes only the rating is provided, the userrating and stuff like that is gone. ListItem are populated and working. 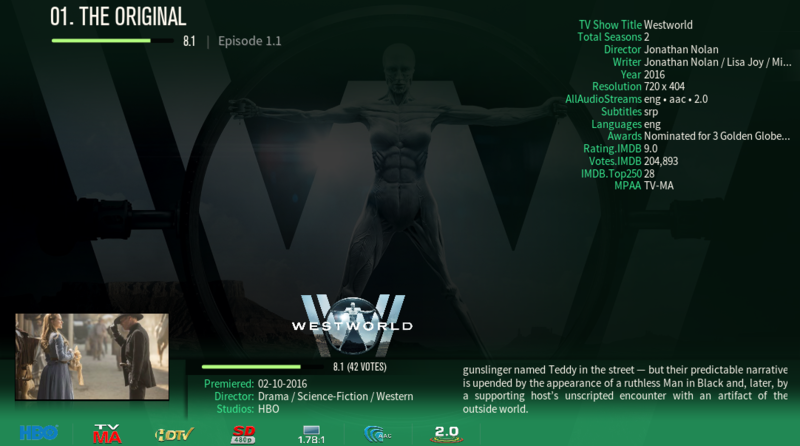 Is the Listitem.TvShowTitle info label filled properly (or Videoplayer.TvShowTitle in this case) for episodes ? That's what's used to grab the tvshow data. Got it. The thing is its taking a really long time for the first initial sync. I have a big collection but that impact in any sort? Also, when you mention "apply for api keys" you mean pay and enter the API key in your script, right? (2017-09-14, 01:42)djhifi Wrote: [ -> ] Got it. The thing is its taking a really long time for the first initial sync. I have a big collection but that impact in any sort? Also, when you mention "apply for api keys" you mean pay and enter the API key in your script, right? I have try : plugin://script.skin.helper.widgets/?action=browsegenres&mediatype=randommovies&limit=1000 and plugin://script.skin.helper.widgets/?action=browsegenres&mediatype=randomtvshows&limit=1000 but not working. There has been a lot of chatter about API keys, here are some instructions on how to get the common ones for Skin Helper Service and Artwork Downloader. The rest of the fields are just your personal info, populate them and click submit. FYI: I also edit the tvdb.py file (line 41) to add my personal key for the TVDB, since i set one up. Note 1: For the fanart.tv API key I had to apply for the Project API Keys, the Personal API Keys option did not download all the artwork. Note 2: For the themoviedb.org API key I applied for the Developer Key. I used Notepad++ to edit the files and it can be downloaded HERE - Once you have that installed you can browse over to edit the (2) files. (2017-09-13, 20:18)marcelveldt Wrote: [ -> ] for RottenTomatoes only the rating is provided, the userrating and stuff like that is gone. Critic and Audience Scores. Tomatometer and Audience scores for movies. Critic Reviews. A sampling of critic reviews for each movie. Detailed movie metadata. We only provide a subset of metadata to help with title matching. Posters and images. We do not offer high-resolution images; these will need to be sourced from a metadata provider. To apply for access to the Rotten Tomatoes API, please submit a proposal form outlining how you would like to use Rotten Tomatoes data. We will review each application to assess whether you are a good candidate based on our updated policies. Please note that at this time we no longer support unauthorized use of our data (e.g. unofficial projects, non-user facing data integrations). Is that an old page? Seems to me that is possibile (if you register it) to enter the API key and get it work. Artworks are never displayed for artists like "Des'ree" or "Diam's"
Could you have a look at that too? Or @Gracus you could wait for v18... that will have nominated location for artist artwork as part of Kodi core. It may be better to focus effort on that, and what skins needs from core to be able to use it, than changes to SHS. (2017-09-15, 23:57)DaveBlake Wrote: [ -> ] Or @Gracus you could wait for v18... that will have nominated location for artist artwork as part of Kodi core. It may be better to focus effort on that, and what skins needs from core to be able to use it, than changes to SHS. Sounds very interesting. Is there a PR for this? You are of course right about limited time and help with deveolpment is welcome, the active dev team is very small compared to the millions of users Kodi has. But to my knowledge there is no "roadmap" it is just a matter of what gets done (implemented and approved) in time. While I am not going to be able to replace SHS, and not sure I would even want to try, I am working on where Kodi looks for artist nfo and art. The current approach - trying to identify a unique folder in the music files - is flawed. It can only work for abum artists with very simple muisc folder layouts, collaborations (multiple album artists) or multiple music sources confuse it. In v18 there will be a nominated artists folder, and it would be sensible for addons that fetch art to use this folder too, not go off and create yet another structure with different naming etc. I don't have time to trawl through Python and work out how these addons work, and I am not even a regular addon user, so I am unclear on what addons like SHS need to be able to make use of the features I am adding. All I can do is raise awareness of what I am working on, and hope that those on the addon side of things will come forward and work with me. For example if there are issues with turning artist names into folders, then it would help me to know about it and to work together to come up with a collective solution that can be implemented in core and accessed by addons. The v18 music db already holds Muisicbrainz release group id. It is this, not Muisicbrainz (album) release id, that is needed for online lookup of album art and info. Using this would speed up art retrieval by removing the need to requery Muiscbrainz (throttled to 1 call per sec), but I need to know what needs adding so that SHS and other addons have access to this. (2017-09-16, 07:50)Gade Wrote: [ -> ] Sounds very interesting. Is there a PR for this? Not quite but near, the work is in my repo. I am working on it as part of improving the music library export/import facility. The aim is to reduce the number of times users rescrape the same online information. If we continue to unnecessarily batter the servers of the free online music info services they will eventually either fail or limit Kodi's access. Better export/import will mean that users can save scraped data locally and restore it to any fresh installations with ease. I know that core changes are slow compared to addon development, but I would like to work with the addon devs and users rather than in isolation. Some design and testing discussion here 2644241 (post) Perhaps a better place to discuss it than mixed in with other SHS requests?